For these ciccheti the slice of polenta doubles as a cracker, much the way slabs of it replace bread in the mountains of the Alto Adige. The sausage, luganega, is a spicy specialty of Belluna, in the mountains. In Venice proper a piece of grilled sardine, a grilled shrimp, or a morsel of meat or fried fish from dinner the day before might top the polenta. “You find that leftovers make fine cicchetti,” Francesco says. Bring the water to a simmer in a small saucepan. Gradually stir in the cornmeal and cook, stirring, about 15 minutes until the texture has thickened. Season with salt and stir in 1 tablespoon of the olive oil. Spread the cornmeal mixture to a thickness of ½ inch (1.3 cm) on a baking sheet and allow to cool. Heat the remaining oil in a medium-size nonstick skillet. Add the onion and the bay leaf and cook over medium-low heat about 10 minutes, until the onion turns light gold. Stir in 2 tablespoons (30ml) water, remove the bay leaf and remove the skillet from the heat. Grill the sausage until browned and cooked through. 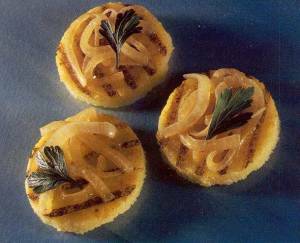 To serve, cut the polenta into 2-inch (5 cm) circles with a glass or a biscuit cutter. 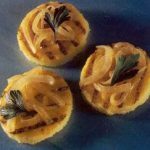 Heat a grill, a nonstick skillet, or a griddle and grill the polenta circles until they are warmed and lightly browned. Top each with some of the onion and a parsley leaf. Cut the sausage on a sharp diagonal into slices about ½ inch (1.3 cm) thick and place on top or, if desired, substitute with shrimp.